HSL (hue, saturation, lightness) and HSV (hue, saturation, value) are alternative representations of the RGB color model, designed in the 1970s by computer graphics researchers to more closely align with the way human vision perceives color-making attributes. In these models, colors of each hue are arranged in a radial slice, around a central axis of neutral colors which ranges from black at the bottom to white at the top. The HSV representation models the way paints of different colors mix together, with the saturation dimension resembling various shades of brightly colored paint, and the value dimension resembling the mixture of those paints with varying amounts of black or white paint. The HSL model attempts to resemble more perceptual color models such as the Natural Color System (NCS) or Munsell color system, placing fully saturated colors around a circle at a lightness value of ​1⁄2, where a lightness value of 0 or 1 is fully black or white, respectively. HSL and HSV are both cylindrical geometries (fig. 2), with hue, their angular dimension, starting at the red primary at 0°, passing through the green primary at 120° and the blue primary at 240°, and then wrapping back to red at 360°. In each geometry, the central vertical axis comprises the neutral, achromatic, or gray colors, ranging from black at lightness 0 or value 0, the bottom, to white at lightness 1 or value 1, the top. In both geometries, the additive primary and secondary colors—red, yellow, green, cyan, blue and magenta—and linear mixtures between adjacent pairs of them, sometimes called pure colors, are arranged around the outside edge of the cylinder with saturation 1. These saturated colors have lightness 0.5 in HSL, while in HSV they have value 1. Mixing these pure colors with black—producing so-called shades—leaves saturation unchanged. In HSL, saturation is also unchanged by tinting with white, and only mixtures with both black and white—called tones—have saturation less than 1. In HSV, tinting alone reduces saturation. Fig. 3a–b. If we plot hue and (a) HSL lightness or (b) HSV value against chroma (range of RGB values) rather than saturation (chroma over maximum chroma for that slice), the resulting solid is a bicone or cone, respectively, not a cylinder. 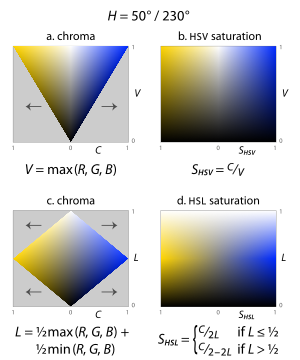 Such diagrams often claim to represent HSL or HSV directly, with the chroma dimension confusingly labelled "saturation". 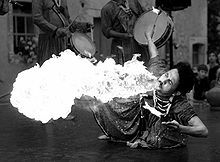 The HSL color space was invented[further explanation needed] in 1938 by Georges Valensi as a method to add color encoding to existing monochrome (i.e. only containing the L signal) broadcasts, allowing existing receivers to receive new color broadcasts (in black and white) without modification as the luminance (black and white) signal is broadcast unmodified. It has been used in all major analog broadcast television encoding including NTSC, PAL and SECAM and all major digital broadcast systems and is the basis for composite video. Fig. 4. Painters long mixed colors by combining relatively bright pigments with black and white. 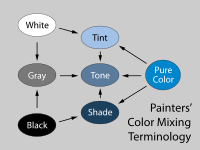 Mixtures with white are called tints, mixtures with black are called shades, and mixtures with both are called tones. See Tints and shades. Fig. 5. This 1916 color model by German chemist Wilhelm Ostwald exemplifies the "mixtures with white and black" approach, organizing 24 "pure" colors into a hue circle, and colors of each hue into a triangle. The model thus takes the shape of a bicone. Fig. 6a. 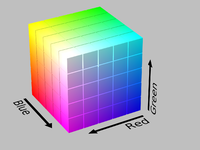 The RGB gamut can be arranged in a cube. Fig. 6b. The same image, with a portion removed for clarity. Fig. 7. Tektronix graphics terminals used the earliest commercial implementation of HSL, in 1979. This diagram, from a patent filed in 1983, shows the bicone geometry underlying the model. For example, imagine we have an RGB display whose color is controlled by three sliders ranging from 0–255, one controlling the intensity of each of the red, green, and blue primaries. If we begin with a relatively colorful orange , with sRGB values R = 217, G = 118, B = 33, and want to reduce its colorfulness by half to a less saturated orange , we would need to drag the sliders to decrease R by 31, increase G by 24, and increase B by 59, as pictured below. In an attempt to accommodate more traditional and intuitive color mixing models, computer graphics pioneers at PARC and NYIT developed[further explanation needed] the HSV model in the mid-1970s, formally described by Alvy Ray Smith in the August 1978 issue of Computer Graphics. 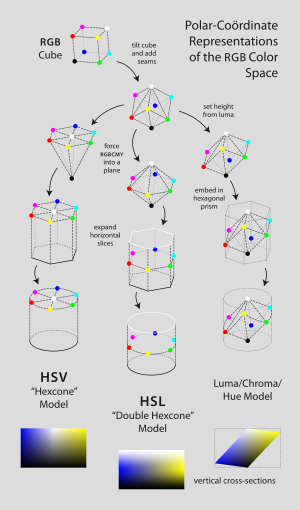 In the same issue, Joblove and Greenberg described the HSL model—whose dimensions they labeled hue, relative chroma, and intensity—and compared it to HSV (fig. 1). Their model was based more upon how colors are organized and conceptualized in human vision in terms of other color-making attributes, such as hue, lightness, and chroma; as well as upon traditional color mixing methods—e.g., in painting—that involve mixing brightly colored pigments with black or white to achieve lighter, darker, or less colorful colors. The following year, 1979, at SIGGRAPH, Tektronix introduced graphics terminals using HSL for color designation, and the Computer Graphics Standards Committee recommended it in their annual status report (fig. 7). These models were useful not only because they were more intuitive than raw RGB values, but also because the conversions to and from RGB were extremely fast to compute: they could run in real time on the hardware of the 1970s. Consequently, these models and similar ones have become ubiquitous throughout image editing and graphics software since then. 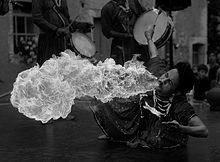 Some of their uses are described below. Fig. 8. The geometric derivation of the cylindrical HSL and HSV representations of an RGB "colorcube". The "attribute of a visual sensation according to which an area appears to be similar to one of the perceived colors: red, yellow, green, and blue, or to a combination of two of them". The radiant power of light passing through a particular surface per unit solid angle per unit projected area, measured in SI units in watt per steradian per square metre (W·sr−1·m−2). The radiance weighted by the effect of each wavelength on a typical human observer, measured in SI units in candela per square meter (cd/m2). Often the term luminance is used for the relative luminance, Y/Yn, where Yn is the luminance of the reference white point. The weighted sum of gamma-corrected R′, G′, and B′ values, and used in Y′CbCr, for JPEG compression and video transmission. The "attribute of a visual sensation according to which an area appears to emit more or less light". The "brightness relative to the brightness of a similarly illuminated white". The "attribute of a visual sensation according to which the perceived color of an area appears to be more or less chromatic". The "colorfulness relative to the brightness of a similarly illuminated white". The "colorfulness of a stimulus relative to its own brightness". Brightness and colorfulness are absolute measures, which usually describe the spectral distribution of light entering the eye, while lightness and chroma are measured relative to some white point, and are thus often used for descriptions of surface colors, remaining roughly constant even as brightness and colorfulness change with different illumination. Saturation can be defined as either the ratio of colorfulness to brightness or that of chroma to lightness. HSL, HSV, and related models can be derived via geometric strategies, or can be thought of as specific instances of a "generalized LHS model". 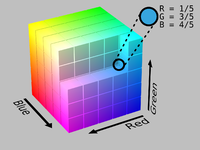 The HSL and HSV model-builders took an RGB cube—with constituent amounts of red, green, and blue light in a color denoted R, G, B ∈ [0, 1][E]—and tilted it on its corner, so that black rested at the origin with white directly above it along the vertical axis, then measured the hue of the colors in the cube by their angle around that axis, starting with red at 0°. Then they came up with a characterization of brightness/value/lightness, and defined saturation to range from 0 along the axis to 1 at the most colorful point for each pair of other parameters. Fig. 9. Both hue and chroma are defined based on the projection of the RGB cube onto a hexagon in the "chromaticity plane". Chroma is the relative size of the hexagon passing through a point, and hue is how far around that hexagon's edge the point lies. To understand why chroma can be written as M − m, notice that any neutral color, with R = G = B, projects onto the origin and so has 0 chroma. Thus if we add or subtract the same amount from all three of R, G, and B, we move vertically within our tilted cube, and do not change the projection. Therefore, any two colors (R, G, B) and (R − m, G − m, B − m) project on the same point, and have the same chroma. The chroma of a color with one of its components equal to zero (m = 0) is simply the maximum of the other two components. This chroma is M in the particular case of a color with a zero component, and M − m in general. Sometimes, neutral colors (i.e. with C = 0) are assigned a hue of 0° for convenience of representation. Fig. 10. The definitions of hue and chroma in HSL and HSV have the effect of warping hexagons into circles. These definitions amount to a geometric warping of hexagons into circles: each side of the hexagon is mapped linearly onto a 60° arc of the circle (fig. 10). After such a transformation, hue is precisely the angle around the origin and chroma the distance from the origin: the angle and magnitude of the vector pointing to a color. Fig. 11. 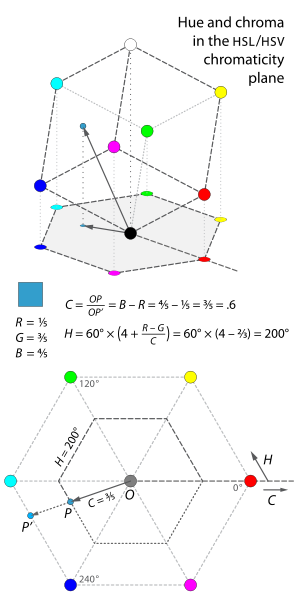 Constructing rectangular chromaticity coordinates α and β, and then transforming those into hue H2 and chroma C2 yields slightly different values than computing hexagonal hue H and chroma C: compare the numbers in this diagram to those earlier in this section. Notice that these two definitions of hue (H and H2) nearly coincide, with a maximum difference between them for any color of about 1.12°—which occurs at twelve particular hues, for instance H = 13.38°, H2 = 12.26°—and with H = H2 for every multiple of 30°. 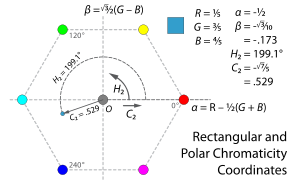 The two definitions of chroma (C and C2) differ more substantially: they are equal at the corners of our hexagon, but at points halfway between two corners, such as H = H2 = 30°, we have C = 1, but C2 = √¾ ≈ 0.866, a difference of about 13.4%. Fig. 12a–d. Four different possible "lightness" dimensions, plotted against chroma, for a pair of complementary hues. Each plot is a vertical cross-section of its three-dimensional color solid. The simplest definition is just the average of the three components, in the HSI model called intensity (fig. 12a). This is simply the projection of a point onto the neutral axis—the vertical height of a point in our tilted cube. The advantage is that, together with Euclidean-distance calculations of hue and chroma, this representation preserves distances and angles from the geometry of the RGB cube. In the HSV "hexcone" model, value is defined as the largest component of a color, our M above (fig. 12b). This places all three primaries, and also all of the "secondary colors"—cyan, yellow, and magenta—into a plane with white, forming a hexagonal pyramid out of the RGB cube. In the HSL "bi-hexcone" model, lightness is defined as the average of the largest and smallest color components (fig. 12c). This definition also puts the primary and secondary colors into a plane, but a plane passing halfway between white and black. 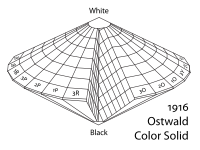 The resulting color solid is a double-cone similar to Ostwald's, shown above. All four of these leave the neutral axis alone. That is, for colors with R = G = B, any of the four formulations yields a lightness equal to the value of R, G, or B. For a graphical comparison, see fig. 13 below. Fig. 14a–d. In both HSL and HSV, saturation is simply the chroma scaled to fill the interval [0, 1] for every combination of hue and lightness or value. When encoding colors in a hue/lightness/chroma or hue/value/chroma model (using the definitions from the previous two sections) model, not all combinations of lightness (or value) and chroma are meaningful: that is, half of the colors denotable using H ∈ [0°, 360°), C ∈ [0, 1], and V ∈ [0, 1] fall outside the RGB gamut (the gray parts of the slices in figure 14). The creators of these models considered this a problem for some uses. For example, in a color selection interface with two of the dimensions in a rectangle and the third on a slider, half of that rectangle is made of unused space. Now imagine we have a slider for lightness: the user's intent when adjusting this slider is potentially ambiguous: how should the software deal with out-of-gamut colors? Or conversely, If the user has selected as colorful as possible a dark purple , and then shifts the lightness slider upward, what should be done: would the user prefer to see a lighter purple still as colorful as possible for the given hue and lightness , or a lighter purple of exactly the same chroma as the original color ? 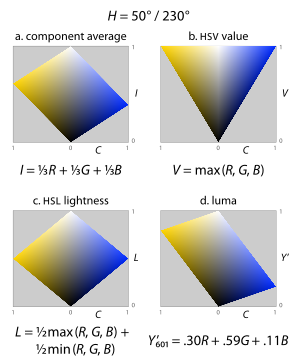 To solve problems such as these, the HSL and HSV models scale the chroma so that it always fits into the range [0, 1] for every combination of hue and lightness or value, calling the new attribute saturation in both cases (fig. 14). To calculate either, simply divide the chroma by the maximum chroma for that value or lightness. Fig. 15a–b. 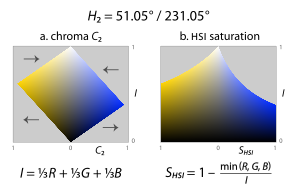 In HSI, saturation, shown in the slice on the right, is roughly the chroma relative to lightness. Also common is a model with dimensions I, H2, C2, shown in the slice on the left. Notice that the hue in these slices is the same as the hue above, but H differs slightly from H2. The HSI model commonly used for computer vision, which takes H2 as a hue dimension and the component average I ("intensity") as a lightness dimension, does not attempt to "fill" a cylinder by its definition of saturation. Instead of presenting color choice or modification interfaces to end users, the goal of HSI is to facilitate separation of shapes in an image. Saturation is therefore defined in line with the psychometric definition: chroma relative to lightness (fig. 15). See the Use in image analysis section of this article. Using the same name for these three different definitions of saturation leads to some confusion, as the three attributes describe substantially different color relationships; in HSV and HSI, the term roughly matches the psychometric definition, of a chroma of a color relative to its own lightness, but in HSL it does not come close. Even worse, the word saturation is also often used for one of the measurements we call chroma above (C or C2). · (g) NeXTSTEP, c. 1995. Fig. 17. xv's HSV-based color modifier. Fig. 18. The hue/saturation tool in Photoshop 2.5, ca. 1992. Video editors also use these models. For example, both Avid and Final Cut Pro include color tools based on HSL or a similar geometry for use adjusting the color in video. With the Avid tool, users pick a vector by clicking a point within the hue/saturation circle to shift all the colors at some lightness level (shadows, mid-tones, highlights) by that vector. HSL, HSV, HSI, or related models are often used in computer vision and image analysis for feature detection or image segmentation. The applications of such tools include object detection, for instance in robot vision; object recognition, for instance of faces, text, or license plates; content-based image retrieval; and analysis of medical images. For the most part, computer vision algorithms used on color images are straightforward extensions to algorithms designed for grayscale images, for instance k-means or fuzzy clustering of pixel colors, or canny edge detection. At the simplest, each color component is separately passed through the same algorithm. It is important, therefore, that the features of interest can be distinguished in the color dimensions used. Because the R, G, and B components of an object's color in a digital image are all correlated with the amount of light hitting the object, and therefore with each other, image descriptions in terms of those components make object discrimination difficult. Descriptions in terms of hue/lightness/chroma or hue/lightness/saturation are often more relevant. Fig 20a. The sRGB gamut mapped in CIELAB space. Notice that the lines pointing to the red, green, and blue primaries are not evenly spaced by hue angle, and are of unequal length. The primaries also have different L* values. Fig 20b. 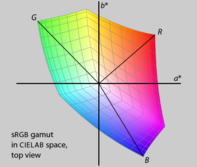 The Adobe RGB gamut mapped in CIELAB space. Also notice that these two RGB spaces have different gamuts, and thus will have different HSL and HSV representations. HSL and HSV are simple transformations of RGB which preserve symmetries in the RGB cube unrelated to human perception, such that its R, G, and B corners are equidistant from the neutral axis, and equally spaced around it. If we plot the RGB gamut in a more perceptually-uniform space, such as CIELAB (see below), it becomes immediately clear that the red, green, and blue primaries do not have the same lightness or chroma, or evenly spaced hues. 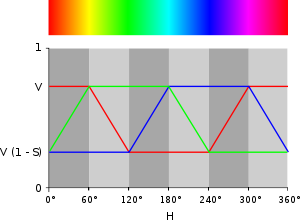 Furthermore, different RGB displays use different primaries, and so have different gamuts. 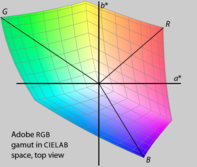 Because HSL and HSV are defined purely with reference to some RGB space, they are not absolute color spaces: to specify a color precisely requires reporting not only HSL or HSV values, but also the characteristics of the RGB space they are based on, including the gamma correction in use. If we take an image and extract the hue, saturation, and lightness or value components, and then compare these to the components of the same name as defined by color scientists, we can quickly see the difference, perceptually. For example, examine the following images of a fire breather (fig. 13). The original is in the sRGB colorspace. CIELAB L* is a CIE-defined achromatic lightness quantity (dependent solely on the perceptually achromatic luminance Y, but not the mixed-chromatic components X or Z, of the CIEXYZ colorspace from which the sRGB colorspace itself is derived), and it is plain that this appears similar in perceptual lightness to the original color image. Luma is roughly similar, but differs somewhat at high chroma, where it deviates most from depending solely on the true achromatic luminance (Y, or equivalently L*) and is influenced by the colorimetric chromaticity (x,y, or equivalently, a*,b* of CIELAB). HSL L and HSV V, by contrast, diverge substantially from perceptual lightness. Fig. 13a. Color photograph (sRGB colorspace). Fig. 13b. CIELAB L* (further transformed back to sRGB for consistent display). Fig. 13c. Rec. 601 luma Y'. Fig. 13d. Component average: "intensity" I. Fig. 13e. HSV value V.
Fig. 13f. HSL lightness L.
Computer science offers a few poorer cousins to these perceptual spaces that may also turn up in your software interface, such as HSV and HLS. They are easy mathematical transformations of RGB, and they seem to be perceptual systems because they make use of the hue–lightness/value–saturation terminology. But take a close look; don't be fooled. Perceptual color dimensions are poorly scaled by the color specifications that are provided in these and some other systems. For example, saturation and lightness are confounded, so a saturation scale may also contain a wide range of lightnesses (for example, it may progress from white to green which is a combination of both lightness and saturation). Likewise, hue and lightness are confounded so, for example, a saturated yellow and saturated blue may be designated as the same 'lightness' but have wide differences in perceived lightness. These flaws make the systems difficult to use to control the look of a color scheme in a systematic manner. If much tweaking is required to achieve the desired effect, the system offers little benefit over grappling with raw specifications in RGB or CMY. If these problems make HSL and HSV problematic for choosing colors or color schemes, they make them much worse for image adjustment. HSL and HSV, as Brewer mentioned, confound perceptual color-making attributes, so that changing any dimension results in non-uniform changes to all three perceptual dimensions, and distorts all of the color relationships in the image. For instance, rotating the hue of a pure dark blue toward green will also reduce its perceived chroma, and increase its perceived lightness (the latter is grayer and lighter), but the same hue rotation will have the opposite impact on lightness and chroma of a lighter bluish-green— to (the latter is more colorful and slightly darker). In the example below (fig. 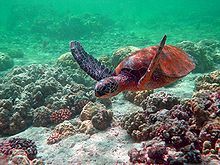 21), the image on the left (a) is the original photograph of a green turtle. In the middle image (b), we have rotated the hue (H) of each color by −30°, while keeping HSV value and saturation or HSL lightness and saturation constant. In the image on the right (c), we make the same rotation to the HSL/HSV hue of each color, but then we force the CIELAB lightness (L*, a decent approximation of perceived lightness) to remain constant. Notice how the hue-shifted middle version without such a correction dramatically changes the perceived lightness relationships between colors in the image. In particular, the turtle's shell is much darker and has less contrast, and the background water is much lighter. Fig. 21b. HSL/HSV hue of each color shifted by −30°. Fig. 21c. Hue shifted but CIELAB lightness (L*) kept as in the original. Because hue is a circular quantity, represented numerically with a discontinuity at 360°, it is difficult to use in statistical computations or quantitative comparisons: analysis requires the use of circular statistics. Furthermore, hue is defined piecewise, in 60° chunks, where the relationship of lightness, value, and chroma to R, G, and B depends on the hue chunk in question. This definition introduces discontinuities, corners which can plainly be seen in horizontal slices of HSL or HSV. HSB and HLS were developed to specify numerical Hue, Saturation and Brightness (or Hue, Lightness and Saturation) in an age when users had to specify colors numerically. The usual formulations of HSB and HLS are flawed with respect to the properties of color vision. Now that users can choose colors visually, or choose colors related to other media (such as PANTONE), or use perceptually-based systems like L*u*v* and L*a*b*, HSB and HLS should be abandoned. The creators of HSL and HSV were far from the first to imagine colors fitting into conic or spherical shapes, with neutrals running from black to white in a central axis, and hues corresponding to angles around that axis. Similar arrangements date back to the 18th century, and continue to be developed in the most modern and scientific models. Mouse over the swatches below to see the R, G, and B values for each swatch in a tooltip. ^ The Joblove and Greenberg (1978) paper first introducing HSL, they called HSL lightness "intensity", called HSL saturation "relative chroma", called HSV saturation "saturation" and called HSV value "value". They carefully and unambiguously described and compared three models: hue/chroma/intensity, hue/relative chroma/intensity, and hue/value/saturation. Unfortunately, later authors were less fastidious, and current usage of these terms is inconsistent and often misleading. ^ The name hexcone for hexagonal pyramid was coined in Smith (1978), and stuck. ^ For instance, a 1982 study by Berk, et al., found that users were better at describing colors in terms of HSL than RGB coordinates, after being taught both systems, but were much better still at describing them in terms of the natural-language CNS model (which uses names such as "very dark grayish yellow-green" or "medium strong bluish purple"). This shouldn't be taken as gospel however: a 1987 study by Schwarz, et al., found that users could match colors using RGB controls faster than with HSL controls; a 1999 study by Douglas and Kirkpatrick found that the visual feedback in the user interface mattered more than the particular color model in use, for user matching speed. ^ "Clearly, if color appearance is to be described in a systematic, mathematical way, definitions of the phenomena being described need to be precise and universally agreed upon." ^ In Levkowitz and Herman’s formulation, R, G, and B stand for the voltages on the guns of a CRT display, which might have different maxima, and so their cartesian gamut could be a box of any unequal dimensions. Other definitions commonly use integer values in the range [0, 255], storing the value for each component in one byte. We define the RGB gamut to be a unit cube for convenience because it simplifies and clarifies the math. Also, in general, HSL and HSV are today computed directly from gamma-corrected R′, G′, and B′—for instance in sRGB space—but, when the models were developed, might have been transformations of a linear RGB space. Early authors don’t address gamma correction at all, except Alvy Ray Smith who clearly states that "We shall assume that an RGB monitor is a linear device", and thus designed HSV using linear RGB. We will drop the primes, and the labels R, G, and B should be taken to stand for the three attributes of the origin RGB space, whether or not it is gamma corrected. ^ Using the chroma here not only agrees with the original Joblove and Greenberg (1978) paper, but is also in the proper spirit of the psychometric definition of the term. Some models call this attribute saturation—for instance Adobe Photoshop's "Saturation" blend mode—but such use is even more confusing than the use of the term in HSL or HSV, especially when two substantially different definitions are used side by side. ^ In the following, the multiplication of hue by 60°—that is, 360°/6—can be seen as the hexagonal-geometry analogue of the conversion from radians to degrees, a multiplication by 360°/2π: the circumference of a unit circle is 2π; the circumference of a unit hexagon is 6. ^ For a more specific discussion of the term luma, see Charles Poynton (2008). See also RGB color space#Specifications. Photoshop exclusively uses the NTSC coefficients for its "Luminosity" blend mode regardless of the RGB color space involved. ^ The first nine colors in this table were chosen by hand, and the last ten colors were chosen at random. ^ See Smith (1978). Many of these screenshots were taken from the GUIdebook, and the rest were gathered from image search results. ^ For instance, a tool in Illustrator CS4, and Adobe's related web tool, Kuler, both allow users to define color schemes based on HSV relationships, but with a hue circle modified to better match the RYB model used traditionally by painters. The web tools ColorJack, Color Wizard, and ColorBlender all pick color schemes with reference to HSL or HSV. ^ ArcGIS calls its map-symbol gradients "color ramps". Current versions of ArcGIS can use CIELAB instead for defining them. ^ For instance, the first version of Photoshop had an HSL-based tool; see "Photoshop hue/saturation" in the GUIdebook for screenshots. ^ Photoshop's documentation explains that, e.g., "Luminosity: Creates a result color with the hue and saturation of the base color and the luminance of the blend color." ^ The Ohta et al. model has parameters I1 = (R + G + B)/3, I2 = (R − B)/2, I3 = (2G − R − B)/4. I1 is the same as our I, and I2 and I3 are similar to our β and α, respectively, except that (a) where α points in the direction of R in the "chromaticity plane", I3 points in the direction of G, and (b) the parameters have a different linear scaling which avoids the √3 of our β. ^ Some points in this cylinder fall out of gamut. ^ Wilhelm Ostwald (1916). Die Farbenfibel. Leipzig. ^ Wilhelm Ostwald (1918). Die Harmonie der Farben. Leipzig. ^ Toby Berk; Arie Kaufman; Lee Brownston (August 1982). 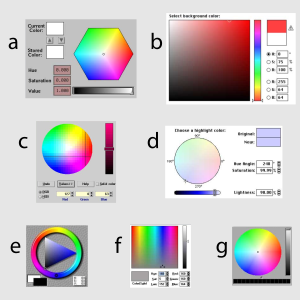 "A human factors study of color notation systems for computer graphics". Communications of the ACM. 25 (8): 547–550. doi:10.1145/358589.358606. ^ Michael W. Schwarz; William B. Cowan; John C. Beatty (April 1987). "An experimental comparison of RGB, YIQ, LAB, HSV, and opponent color models". ACM Transactions on Graphics. 6 (2): 123–158. doi:10.1145/31336.31338. ^ Sarah A. Douglas; Arthur E. Kirkpatrick (April 1999). "Model and representation: the effect of visual feedback on human performance in a color picker interface". ACM Transactions on Graphics. 18 (2): 96–127. doi:10.1145/318009.318011. ^ Maureen C. Stone (August 2001). "A Survey of Color for Computer Graphics". Course at SIGGRAPH 2001. ^ Ware Myers (July 1979). "Interactive Computer Graphics: Flying High-Part I". Computer. 12 (7): 8–17. doi:10.1109/MC.1979.1658808. ^ N. Magnetat-Thalmann; N. Chourot; D. Thalmann (March 1984). "Colour Gradation, Shading and Texture Using a Limited Terminal". Computer Graphics Forum. 3: 83–90. doi:10.1111/j.1467-8659.1984.tb00092.x. ^ Computer Graphics Staff (August 1979). "Status Report of the Graphics Standards Planning Committee". ACM SIGGRAPH Computer Graphics. 13 (3): 1–10. doi:10.1145/988497.988498. ^ Standard Terminology of Appearance E284. ASTM. 2009. ^ International Lighting Vocabulary (4th ed.). CIE and IEC. 1987. ISBN 978-3-900734-07-7. ^ Sharma, G. (2003). Digital Color Imaging Handbook. Boca Raton, FL: CRC Press. ISBN 978-0-8493-0900-7. ^ Patrick Lambert; Thierry Carron (1999). "Symbolic fusion of luminance-hue-chroma features for region segmentation". Pattern Recognition. 32 (11): 1857. doi:10.1016/S0031-3203(99)00010-2. ^ Rafael C. Gonzalez and Richard Eugene Woods (2008). Digital Image Processing, 3rd ed. Upper Saddle River, NJ: Prentice Hall. ISBN 0-13-168728-X. pp. 407–413. ^ Poynton (1997). "What weighting of red, green and blue corresponds to brightness?" ^ Bruce Lindbloom (2001-09-25). http://lists.apple.com/archives/colorsync-users/2001/Sep/msg00488.html "Re: Luminosity channel...". ^ Tantek Çelik, Chris Lilley, and L. David Baron (July 2008). "CSS3 Color Module Level 3". ^ "Working with color ramps". Environmental Systems Research Institute. January 2008. Retrieved August 30, 2017. ^ Bradley, John (1994). "The HSV Modification Tools". John's World of XV and Other Cool Stuff. ^ Sinkel, Kiril (January 2010). "User Guide for Picture Window and Picture Window Pro Digital Light & Color" (PDF). Archived from the original (PDF) on 2014-05-12. ^ "Blending Modes". Photoshop User Guide. Adobe Systems Incorporated. February 15, 2017. ^ John Kender (1976). "Saturation, hue and normalized color". Carnegie Mellon University, Computer Science Dept. Pittsburgh, PA.
^ Yu-Ichi Ohta; Takeo Kanade; Toshiyuki Sakai (1980). "Color information for region segmentation". Computer Graphics and Image Processing. 13 (3): 222. doi:10.1016/0146-664X(80)90047-7. ^ Ffrank Perez; Christof Koch (1994). "Toward color image segmentation in analog VLSI: Algorithm and hardware". International Journal of Computer Vision. 12: 17–42. doi:10.1007/BF01420983. ^ Brewer, Cynthia A. (1999). "Color Use Guidelines for Data Representation". Proceedings of the Section on Statistical Graphics. Alexandria, VA: American Statistical Association. pp. 55–60. ^ Fisher, Nicholas (1996). Statistical Analysis of Circular Data. Cambridge, England: Cambridge University Press. ^ Hanbury, Allan (2003). Circular Statistics Applied to Colour Images. 8th Computer Vision Winter Workshop. CiteSeerX 10.1.1.4.1381. ^ Poynton (1997). "What are HSB and HLS?" Agoston, Max K. (2005). Computer Graphics and Geometric Modeling: Implementation and Algorithms. London: Springer. pp. 300–306. ISBN 978-1-85233-818-3. Agoston's book contains a description of HSV and HSL, and algorithms in pseudocode for converting to each from RGB, and back again. Cheng, Heng-Da; Jiang, Xihua; Sun, Angela; Wang, Jingli (2001). "Color image segmentation: Advances and prospects". Pattern Recognition. 34 (12): 2259. CiteSeerX 10.1.1.119.2886. doi:10.1016/S0031-3203(00)00149-7. This computer vision literature review briefly summarizes research in color image segmentation, including that using HSV and HSI representations. Fairchild, Mark D. (2005). Color Appearance Models (2nd ed.). Addison-Wesley. This book doesn't discuss HSL or HSV specifically, but is one of the most readable and precise resources about current color science. Foley, J. D.; et al. (1995). Computer Graphics: Principles and Practice (2nd ed.). Redwood City, CA: Addison-Wesley. ISBN 978-0-201-84840-3. The standard computer graphics textbook of the 1990s, this tome has a chapter full of algorithms for converting between color models, in C.
Hanbury, Allan; Serra, Jean (December 2002). A 3D-polar Coordinate Colour Representation Suitable for Image Analysis. Pattern Recognition and Image Processing Group Technical Report 77. Vienna, Austria: Vienna University of Technology. Hanbury, Allan (2008). "Constructing cylindrical coordinate colour spaces" (PDF). Pattern Recognition Letters. 29 (4): 494–500. CiteSeerX 10.1.1.211.6425. doi:10.1016/j.patrec.2007.11.002. Joblove, George H.; Greenberg, Donald (August 1978). "Color spaces for computer graphics". Computer Graphics. 12 (3): 20–25. doi:10.1145/965139.807362. Joblove and Greenberg's paper was the first describing the HSL model, which it compares to HSV. Kuehni, Rolf G. (2003). Color Space and Its Divisions: Color Order from Antiquity to the present. New York: Wiley. ISBN 978-0-471-32670-0. This book only briefly mentions HSL and HSV, but is a comprehensive description of color order systems through history. Levkowitz, Haim; Herman, Gabor T. (1993). "GLHS: A Generalized Lightness, Hue and Saturation Color Model". CVGIP: Graphical Models and Image Processing. 55 (4): 271–285. doi:10.1006/cgip.1993.1019. This paper explains how both HSL and HSV, as well as other similar models, can be thought of as specific variants of a more general "GLHS" model. Levkowitz and Herman provide pseudocode for converting from RGB to GLHS and back. MacEvoy, Bruce (January 2010). "Color Vision". handprint.com. . Especially the sections about "Modern Color Models" and "Modern Color Theory". MacEvoy's extensive site about color science and paint mixing is one of the best resources on the web. On this page, he explains the color-making attributes, and the general goals and history of color order systems—including HSL and HSV—and their practical relevance to painters. Poynton, Charles (1997). "Frequently Asked Questions About Color". poynton.com. This self-published frequently asked questions page, by digital video expert Charles Poynton, explains, among other things, why in his opinion these models "are useless for the specification of accurate color", and should be abandoned in favor of more psychometrically relevant models. Poynton, Charles (2008). "YUV and luminance considered harmful". poynton.com. Retrieved August 30, 2017. Smith, Alvy Ray (August 1978). "Color gamut transform pairs". Computer Graphics. 12 (3): 12–19. doi:10.1145/965139.807361. This is the original paper describing the "hexcone" model, HSV. Smith was a researcher at NYIT's Computer Graphics Lab. He describes HSV's use in an early digital painting program. HSV Colors by Hector Zenil, The Wolfram Demonstrations Project. HSV to RGB by CodeBeautify.